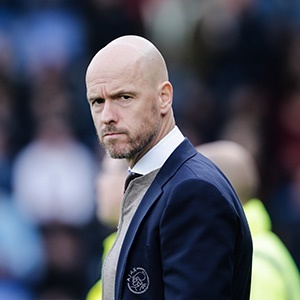 Amsterdam - The return of Ajax to the latter stages of the Champions League is a welcome breath of fresh air for the competition, according to coach Erik ten Hag. The four-time winners of the trophy will take on the Juventus of Cristiano Ronaldo in the first leg of the quarter-finals in Amsterdam on Wednesday, their first appearance in the last eight since 2003. They made a welcome return to the forefront of the European game when they reached the Europa League final two years ago, losing to Manchester United. However, it has become harder for Dutch clubs to compete with the very biggest sides on the continent in recent seasons. Despite that, Ajax have turned the clock back on a run that started in the second qualifying round last July. They went on to stun Real Madrid in the last round, dumping out the holders 5-3 on aggregate. "For Ajax it is very important to play the quarter-finals but also financially the circumstances have really changed in recent years and for a country like the Netherlands it's really difficult to get to this stage," Ten Hag said at a press conference on Tuesday. "Only Portugal have been able to do it as well" among Europe's smaller nations, added the coach, with FC Porto facing Liverpool in the last eight. Last season, all eight quarter-finalists came from the big four European leagues, and there has not been a Dutch representative at this stage since 2007, when PSV Eindhoven were beaten by Liverpool. "It's not only good for Ajax but also for the Champions League as it's not good that each year the same seven or eight clubs get to the quarter-finals and win the Champions League. "That is not what supporters want. Football has to surprise people and it's very nice that we can be the surprise this year." The sides will meet again in the return leg in Turin next Tuesday, April 16, with the winners going through to a semi-final against the winners of the all-English tie between Manchester City and Tottenham Hotspur.